If you seen the America's Got Talent,i'm sure you know who's Drew Thomas. Yes, he's one of the finalist on America's Got Talent as a magician. Believe it or not,his good. 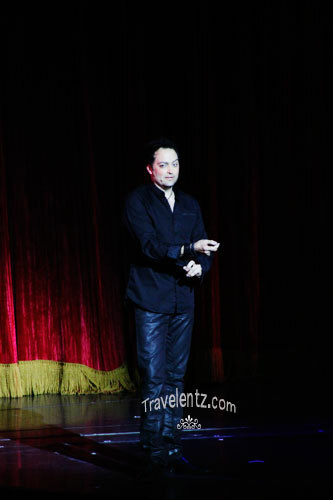 I don't believe magic and illusion until I seen him in Freedom of the Seas "Now You see it".I don't know how he make it, but the show was totally entertaining and phenomenal. He got a talent and his good at it.So, if you want to know more about our onboard experience at Royal Caribbean Freedom of the Seas you can start on Freedom of the Seas Itinerary . Without further ado here are some of the photos during the show. After, Drew Thomas showed his dance skills, I was glued watching on his magic and illusion and I forgot to take any photos on that part as I don't like to blink because I want to see every thing of what his trying to show to the audience. He invited 3 audience to participate in the show and it makes more interesting and fascinating. I'm amaze how he did it. This is the first part of the show "NOW YOU SEE IT". I am not a fan of magic and circus, but from what I have seen in AGT, this guy really has talent to watch out for. Me, too. I do not believe in magic. however, knowing how well they practice to hone their craft, it's truly awesome watching their shows. I haven't watch any episode so I don't know him hehehe. I don't believe in magic either but I do admire those who knows how to do their tricks. I haven't watched an episode of AGT here at home, but I love magic. Though we all know that it was all tricks, it's the entertainment that counts for all of us. To be honest, this is the first time I've heard of this show. I've been very busy lately and have no updates with what's new. LOL I'm looking forward to see more magic shows in the future. i have not seen that show but judging by this post, im sure he's got real raw talent. performing magic and illusions is unique, i hope he makes it to the top. Just like many, I am not into magic and tricks, too. However, people that do them really are fascinating. I love AGT, but haven't watched lately. No time! I haven't watched AGT but since he made it to the few Finalists, he must have been so good. I am enthralled by magics and illusions but since I've seen a TV show divulging how tricky it can be, I never get to appreciate it anymore. It's great though that you've enjoyed the show on board the cruise ship. My family and I like watching magic shows. We are always trying to figure out how they do their tricks. I've seen all AGT episodes, but I honestly don't remember this guy...lol! my family and I love magic shows...it's entertaining! I haven't followed the show as well. But I fancy those magic stuffs. David Blaine is one guy I like. I haven't watched AGT. But man, he sure is good! oh, magic, they are so hard to master, some of my students taught me some tricks of more common magic, and boy, the teacher is having a VERY HARD TIME :) i actually love watching magic shows but have not tried watching the show.